Most real fights are short, fast and brutal. And there are no rules. The martial artist who thinks he's trained to handle what's coming may be in for a painful surprise. But this isn't one of those books about bringing your martial art up to street speed that rips on everything you've worked so hard to learn. It's a book on taking your moves and making them fast, fanged and fierce enough to stand up to a surprise attack. Ex-streetfighter Marc "Animal" MacYoung knows from experience that no matter how much training they've had, most people get overwhelmed in the first critical seconds of a streetfight. And it's nearly impossible to get over the shock of being attacked and organize a viable response while someone is tap dancing on your face. With photos, illustrations and detailed instructions, Animal brings the martial artist from the structured safety of the dojo to the mayhem of the street, alley and biker bar. He teaches you the quickest ways to get your attacker off his feet; how to do bulletproof blocks and throws; how to anticipate a strike and how to make a kicker howl. He also gives you important tips on what to do after a brawl, because such issues as legalities, revenge seekers and your own mental well being last long after the fight is over. 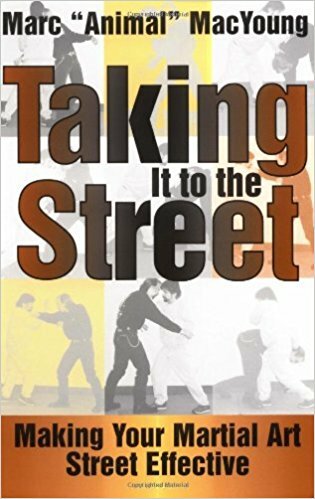 Anyone who's ever wondered if his or her martial arts training would hold up to a real-life attack needs to read this book.